The United States Congress designated the Pine Creek Wilderness (map) in 1984 and it now has a total of 13,261 acres. 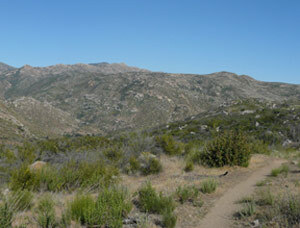 All of this wilderness is located in California and is managed by the Forest Service. The Pine Creek Wilderness is bordered by the Hauser Wilderness to the south. Gently sloping from about 2,000 feet elevation in the south to 4,000 feet in the north, Pine Creek and its numerous tributaries drain this Wilderness in a north-south direction. With the exception of the creek itself, home to rainbow trout and bass, most of the streams dry up part of the year. Chaparral and scrub oak entirely dominate the vegetation, with some riparian and oak woodlands emerging from the stream bottoms. You may see deer, coyotes, mountain lions, gray foxes, hawks, owls, and several species of reptiles. You might also encounter small herds of private livestock grazing because their owners were issued permits prior to designation. Several trails provide access, and receive only light human use. The Espinosa Trail leaves the Horsethief Trailhead on the west side of the Wilderness and switchbacks down into Horsethief Canyon taking you to the waters of Pine Creek. From the pools and falls of Pine Creek the Espinosa Trail continues to the junction with the Secret Canyon Trail, a north / south trail that leads 13 miles to the northern boundary of the Wilderness. Groups are limited to 15 people. Campfires are not permitted. Non-conforming uses (e.g. drug trafficking, nonsystem trails, litter and undocumented immigration) have negatively impacted the wilderness character in the past, though these uses have decreased in recent years. Please call the District Office (619-445-6235) for current conditions and remote camping information. Planning to Visit the Pine Creek Wilderness? How to follow the seven standard Leave No Trace principles differs in different parts of the country (desert vs. Rocky Mountains). Click on any of the principles listed below to learn more about how they apply in the Pine Creek Wilderness.